When you’re first entering into the magical land of social media management, you’ll get a lot of advice. Nothing political. No contentious positions. Don’t comment on current events or laws. I’ve heard people say it time and time again. I break this rule on my personal social media accounts every. single. day. I did this even while I was depending entirely on freelance work for my income. Maybe you think I’m crazy. Maybe you think it’s brave. You probably think it’s stupid. As a professional who focuses entirely on branding and social media in my professional life, I know the power of words and images and the way that those two pieces of content can work together to completely alter someone’s judgment. I know that perception is everything. Branding and politics are sometimes synonymous. For me, they definitely are. My personal brand is me. I’m political. My personal brand is political. I am assertive. My personal brand (pardon my language) takes no sh*t. I won’t stifle who I am for more money. However, there is a time and a place. It’s still a huge no-no for lots of brands. And I explicitly respect that; I get it. No politics on social media is still an extremely valid strategy to pursue. It’s not up to me to force you to insert your beliefs into the content that you create or the messaging you send out. I don’t and won’t judge you for not including it for your own business. It would be absolutely moronic for me to insert my political beliefs onto a client or employer’s social media presence. Never in a million years would I even think about doing something like that. Let me repeat myself: there’s a time and a place. Facebook, where I’ve spent nearly ten years building a “network” of people who are really just family friends and former classmates? Not a place where I share a lot political information. It’s not where users I’ve connected with go for politics and I have no faith in my ability to cipher through any of the advertising and cat-video noise to reach someone in a meaningful way. (In all honesty, I don’t trust the average knowledge of my Facebook friends to be able to conduct productive dialogue regarding political issues.) It wouldn’t bring me or anyone else any value. Now my Twitter? Whew. That’s a completely different story. You could find nearly every political opinion I have through that platform. And I don’t hide it either; it’s extremely easy to find my profile by searching my name. My Instagram is the same way. I try to post weekly content exposing different harmful frameworks and beliefs that I’ve had. Could that content prevent me from getting a job? Probably, on some level. Could it cause me to lose business for my freelance work? Most definitely. Does that mean that I’m going to stop? Never. Including no politics on social media requires that I silence the opinions that are most important to me. Opinions that are vital to my identity and my goals in life. Subjects that I spend hours and hours researching and discussing. Issues that I lie awake at night thinking about. Topics that make me angry and sad and empowered. People that I care deeply for whose lives I want to improve. Heck, people that I don’t know from Adam whose lives I want to improve. My lifeblood. My biggest personal passions. My biggest goals include my politics. Work is great and I’m lucky to absolutely adore what I do: but it’s not what keeps me up at night (well, most of the time anyways). Taking down structures of power, patriarchy, and prejudice to create true equality for all marginalized groups: that’s what keeps me up at night, what makes me emotional, and what makes me work hardest. I have a lot of privilege. I could probably post about politics all day, everyday and I’d still get a job. Being white, upper-middle class, cis-het and able-bodied generally help a person out in that regard. I won’t post about politics on a client’s account without their permission… ever. But I will gently call someone out if they are making an inappropriate comment in my office. Yes, my job is marketing and social media and a lot of other hats, but isn’t it my job to educate and champion for people? 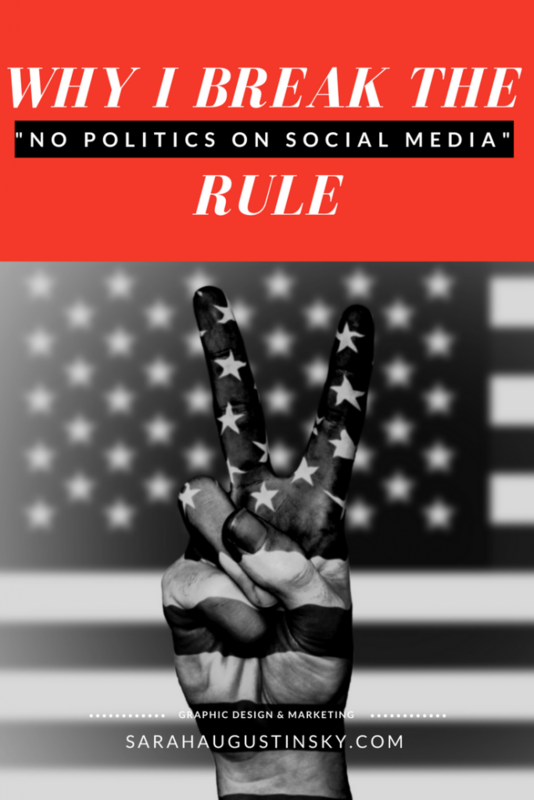 The bottom line: no politics on social media would mean my brand isn’t true to myself. I'm a digital marketing specialist located in Denver, Colorado passionate about design, social media, and content strategy. 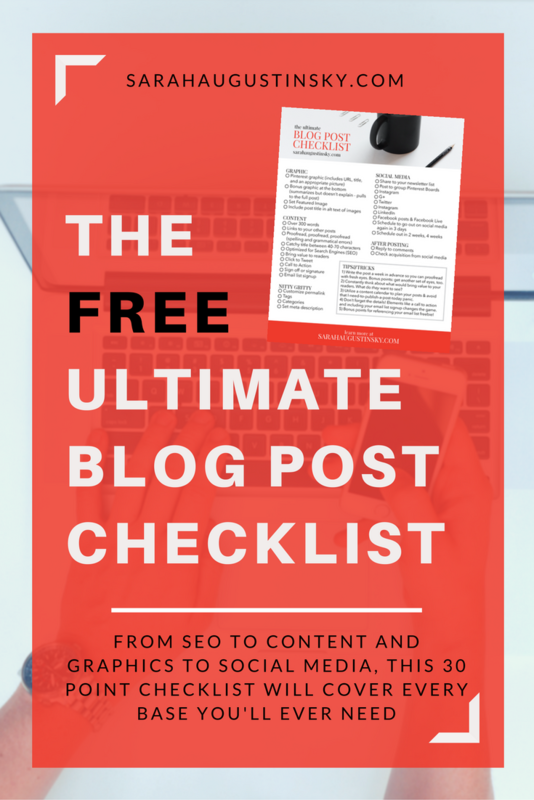 Up Your 2019 Blog Game!